“My Toyota is a 1987 4Runner that I swapped a Chevy 4.3 TBI V6 into and noticed it was extremely warm under the hood with an all aluminum radiator and headers. It would also transmit a lot of heat into the cab via the firewall and if it was warm outside 26°C+ (80°F+) I would have a problem keeping the temperatures down below 210°F going down the highway at highway speeds. Now it stays at 195° all day even when going slow through trails on a hot day. I am very pleased with these hood louvers. Quality craftsmanship and attention — very well done and an awesome touch. “PHENOMENAL!! !…a 47 degree drop in under-hood temp!” — Chief of Police, Chris Garner, Pelion, S.C. Improve power, durability, reliability, A/C cooling and battery life! Prices start at $89/set; over 30 models to select. Satisfaction guaranteed! 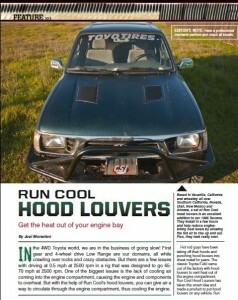 Hot-running Toyotas can run much cooler now with Hood Louvers by RunCool®, as tested and used in the desert by the U.S. Border Patrol! Some owners report drops of 25° on the engine temp gauge!